The Wrecking Ball singer reunited with actor Liam Hemsworth last year (15), and reports suggest the couple's wedding plans are back on. Her dad previously confirmed Miley and Liam are back together, and now he tells In Touch magazine he's a big fan of his daughter's partner - because he makes his little girl smile. "I love that she and Liam are so happy right now," the Achy Breaky Heart singer tells the publication. "Happy is hard to find. So if you're in a good spot, woo! Bam! And Miley knows that. "Seeing her happy is the greatest thing ever." 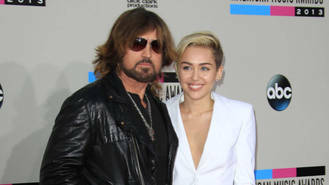 And if the rekindled romance leads to a wedding, Miley and Liam won't have to look far for a volunteer to officiate the ceremony - Billy Ray has already offered his services. The singer/actor, who portrays a dysfunctional Elvis Presley-loving conman preacher in new TV comedy Still the King, says, "They know if they need a preacher they've found one!" Miley and Liam called off their engagement two years ago, but Miley has been spotted wearing the diamond ring The Hunger Games star gave her when he proposed. While the couple has yet to confirm if its wedding plans are officially back on, sources claim the pair is currently ironing out details. "They're getting married on the beach," one insider recently told Us Weekly magazine. Meanwhile, earlier this year (16), Hemsworth dismissed rumours suggesting he was officially engaged again and insisted the pair was not heading down the aisle anytime soon: "I just find it's easier to not talk about my personal life because usually I say the wrong thing, so it ends up just complicating things more," he told Entertainment Tonight.